Distribution: This species has a large range, with an estimated global extent of occurrence of 16,000,000 km 2. It is an afrotropical species which is widespread S of 15°N (South of the Sahara) except in the drier areas of eastern Somalia and the southwest of the continent. It is found in the following countries: Sudan, Ethiopia, Somalia, Senegal, Gambia, Nigeria, Cameroon, Gabon, Uganda, Kenya, Tanzania, DRC, and South Africa. Status: Widespread and common throughout its large range, the Hadeda Ibis is evaluated as Least Concern on the IUCN Red List of Threatened Species. The species is threatened, though, by extended droughts which reduce food availability by causing damp soil to harden, making it more difficult to probe for insects. The population in South Africa also declined markedly at the turn of the century due to hunting during the colonial expansion. Habitat: The Hadeda Ibis's favourite habitats are areas bordering wooded streams and river courses, rainsforests, open moist grassland, bushveld and savanna woodland. It is likewise attracted to man-made irrigated habitats, such as cultivated land, large gardens, urban parks and playing fields. This species may also occur (but as often) in marshes, flooded grassland, the edges of lakes and reservoirs, mangrove swamps, coastal beaches , open woodland and at forest edges. General habits: The Hadeda Ibis is a social bird usually seen in pairs or in small groups of between 5 and 30 birds, and seldom as a single individual. Occasionally it can form flocks of some 50-200 individuals. This species is predominantly sedentary, although it may make local nomadic movements in response to rainfall during periods of drought. During the day, this bird is often seen foraging on lawns, in pairs or in groups. At night, they roost in groups of up to 100, which can be very noisy. The Hadeda Ibis often uses the same roost site year-round, and year after year, although it will wander several kilometres away to forage during the day. Feeding habits: This species is carnivorous, its diet consisting largely of insects (especially weevils, flies, butterfly pupae and beetle larvae), as well as crustaceans, millipedes, centipedes, spiders, earthworms, snails, small lizzards and fish. It may even scavenge for carrion. The Hadeda feeds mostly on the ground and prey is located more by touch than by sight. It uses its long scimitar-like bill to probe soft soil, especially when looking for earthworms, and catches snails in garden beds around residential homes. Breeding habits: The Hadeda Ibis is monogamous and breeds in solitary pairs, unlike other ibis species. The breeding period generally peaks during or just after the rainy season, in late winter and early summer (July to January), although in Gambia and Tanzania breeding is restricted to the dry season. The nesting cycle lasts 2-3 months. Males display before choosing a mate. The pair then engages in mutual bowing and display preening. Nest: The male usually gathers nest materials, which it ritually offers to its mate. The Hadeda's nest is a basket-shaped platform of sticks and twigs placed 1-12 m (usually 3-6 m) above the ground or above water on a horizontal tree branch, in bushes or on man-made structures such as telegraph poles, dam walls or pergolas. It is lined with grass and lichens. Many eggs and young fall from the flimsily constructed nest. The same nest site is usually used year after year, though not necessarily by the same breeding pair. Eggs: This bird lays between 1 and 6 eggs which are green in colour. Incubation is done by both parents, lasting up to 28 days. Both sexes incubate the 2-6 eggs and feed the young. 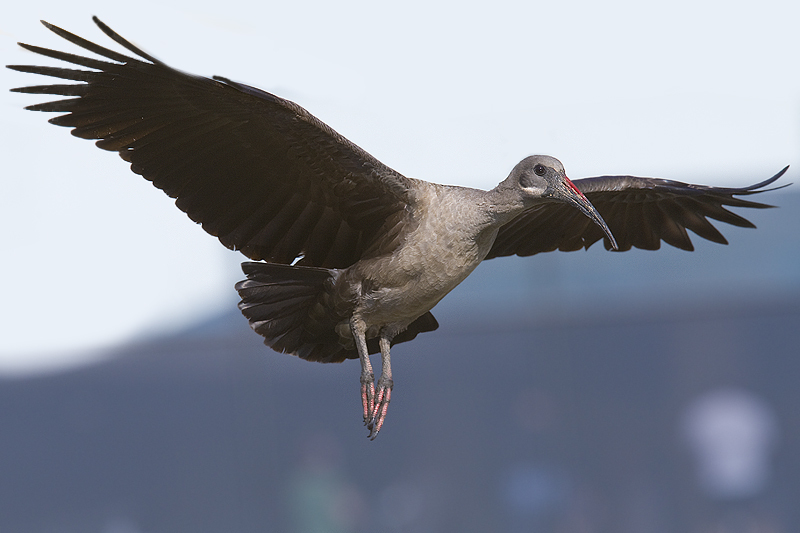 Young: Young Hadeda Ibises are fed by both of their parents and are independent at about 40 days. Call: This bird has a very distinctive call and is often heard before it is seen. It is a loud, harsh, raucous "Haa-Haa-Haa", or "Haa-Daa-Daa", hence its name. The call is often given on take off or in flight, or when the bird is startled. This species is particularly vocal at dawn and dusk on the way from and to their overnight roosts. Description: The Hadeda Ibis is a large, heavy-bodied bird measuring around 76-89 cm for a weight of 1,250 kg. It is grey to dark brown with metallic greenish purple shoulder patches and a long de-curved bill. It also has a conspicuous white "moustache" and red stripe on upper mandible, and blackish legs. Its eyes are brown. In flight, the feet don’t project beyond the tail. The broad and rounded wings flap deeply. Male and female look the same. Researchers have found that the iridescence of the feathers is mainly due to a relatively thick but uniform keratin outer layer on the feather barbules, keratin exhibiting an anomalous dispersion in the green, blue and near UV. The Hadeda may be confused with the similarly dark plumaged Glossy Ibis but even at a distance the white cheek mark is clearly visible. Did you know: The species is hunted and traded at traditional medicine markets in Nigeria.